Heroes of the Victorian avant-garde? Time softens the memories, so I found myself awaiting the arrival of Tate Britain’s radical-sounding new survey of the pre-Raphaelites with an emotion bordering on enthusiasm. It has been nearly 30 years since the last big parade of pre-Raphaelites through the Tate. Time enough, you would have thought, for the wounds to heal. That last survey, in 1984, revealed the Brotherhood to be a cast of demented Victorian wife-swappers whose disgraceful attitude to women was part and parcel of a particularly silly contribution to British art. But that was then. The intervening years have seen a determined effort to understand Victorian art in different ways. What had previously been dismissed as sludge-thick sentimentality and desperate painterly escapism has been re-presented in assorted re-investigations as a misunderstood revolt against 19th-century social restrictions. A new generation of admirers, led by Andrew Lloyd Webber, has set about adjusting our opinion of Victorian art. Their persistence has certainly had an effect. Until this feeble show arrived and convinced me all over again of the incurable ludicrousness of the pre-Raphaelites, ­purveyors of ye olde complete twaddle to the Victorian merchant classes, I was ready to believe they weren’t as bad as I remembered. The worst thing about the present event is the way it promises to view the Brotherhood in a new light, but doesn’t. The way the pre-Raphs are understood and presented here is pretty much exactly as they are always understood and presented. To recap: a group of disillusioned art students at the Royal Academy decide to form a new painterly alliance and challenge the old order. They christen themselves the pre-Raphaelite Brotherhood and take as their inspiration the naïve Italian ­painters who came before Raphael. Dismayed by the crass industrialisation of modern Britain, filled with a powerful religiosity, they turn their backs on the new world and escape deeper and deeper into an imagined ancient one filled with Lancelots and Gueneveres, Lears and Ophelias, Dantes and Jesuses. It’s a familiar story, and one to which nothing signi­ficant is added here. The exhibition paperwork tries to argue that we should see the PRB as avant-gardists, rather than escapists, but the show itself achieves no such revision. That said, calling them escapists is like describing Everest as a hillock. The extraordinary flight from reality recorded here is a journey far beyond the stratosphere of common sense. This is avoidance of reality on such a ­cosmic scale that for long stretches of the display I found myself suppressing the need to laugh. How can anyone ever have taken the pre-Raphaelites seriously? In the final room, Holman Hunt, chief crackpot among the crackpots, turns the familiar religious subject of the flight into Egypt into the craziest night scene in British art. It shows Jesus, Mary and the donkey accompanied across the Egyptian border by a gaggle of glowing babies who glide around the night on “ectoplasmic spheres” — bubbles of soapy luminescence, of the sort you can make with washing-up liquid. Just as absurd is Rossetti’s Astarte Syriaca, a 6ft tall Syrian goddess of love, built like a heavyweight boxer, who stands before us showing off her biceps while adopting the demure pose of the Venus Pudica — the modest Venus who covers her breasts with one hand and her lady garden with the other. For a rough sense of the proportions involved, imagine one of the Klitschko brothers in a big brown wig. The show brings together just about all the best-known paintings by Rossetti, Millais, Holman Hunt, Madox Brown and Burne-Jones, supplementing them with contributions by minor pre-Raphs. If exhibitions were judged only on the quality of their loans, this one would be a high scorer. But they’re not. They are judged as well on the organisation of their material and the points they make. It’s here that the event disappoints profoundly. We begin with a useless introduction that fails to explain or illuminate the PRB’s origins. Their most important precursors were a gang of German neo-medievalists called the Nazarenes, who relocated to Rome in the early 1800s in order to be closer to their spiritual ancestors. The Nazarenes imagined that the Middle Ages were a superior epoch to the present. Their influence on the Brotherhood was crucial. Yet they are represented here by just one small picture, which does little to evoke their spirit or explain their crucial religious example. As a result, Millais’s first pre-Raphaelite painting, a strange medieval dining scene telling the story of Isabella and Lorenzo, seems to arrive from nowhere. One moment there are no pre-Raphaelites. The next they are fully here, fully formed, complete in all their salient details and fully bonkers from the off. On one side of the table, the lovesick Lorenzo passes Isabella an orange, which she receives with a tremulous downward glance, à la Lady Di. On the other side, Isabella’s disapproving brother notices his sister’s intimacy and cracks a nut with ominous intent. Later, I read, the brother murders Lorenzo and buries him in a forest, but Isabella discovers the body, removes her beloved’s head and plants it in a pot of basil, which she dutifully tends! Millais, I also read, alludes to Lorenzo’s fate in the picture by including a pot of herbs. The show contains 180 further examples of this kind of ridiculous plot line. Outside the painter’s window, trains were rattling past, factories were belching, steam presses were puffing, yet here is Millais fantasising about a damsel who kept her lover’s head in a basil pot. A legible chronology has been abandoned in favour of a thematic approach. Unfortunately, the themes are too vague to shape the journey. 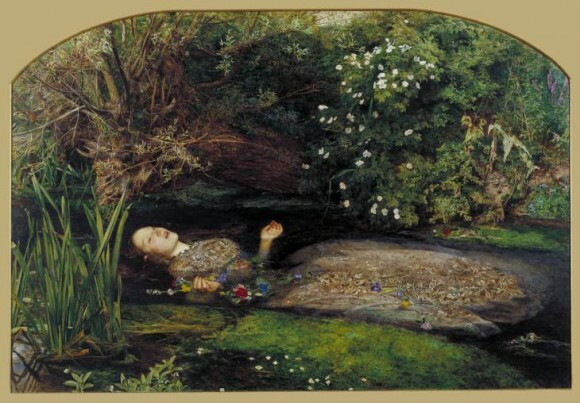 Millais’s Ophelia, begun in 1851, pops up in the Nature section, while his Mariana, based on Measure for Measure and also painted in 1851, pops up in History. While much of the religious art is found in Salvation, much of it is not. The entire middle portion of the show forms a shapeless slab. This also claims to be the first pre-Raphaelite survey to look beyond painting at the important contribution made to the movement by the decorative arts. Thus, the display is lightly sprinkled with cupboards and chairs, and a ­section is given over to the output of Morris and Co.
Another supposed innovation is the inclusion of photography, which influenced the pre-Raphaelites and, in the person of Julia Margaret Cameron, actually introduced a pre-Raphaelite aesthetic into photography. Also new, say the organisers, is the show’s acknowledgement of the female contribution to the movement — not just as notches on Rossetti’s bedpost, but as fellow ­creatives. The evidence for this is thin. All this attempted revision feels half-hearted. In the absence of a coherent journey through the show, the best way to enjoy it is to forget its themes altogether and ­concentrate on searching out its best paintings: Millais’s Ophelia; Holman Hunt’s The Scapegoat; Dyce’s Pegwell Bay; Madox Brown’s Work; Brett’s Val d’Aosta. And the most useful way to group them is, I suggest, the old way, which is to say along biographical lines. Examined as individuals, the main protagonists quickly become ­tangible. Millais is undoubtedly the most technically ­talented. Rossetti the most sexually obsessed. Holman Hunt the one with the most screws missing.